I do not eat potato chips, but my family likes them. It’s fun to mix it up and add color to these ubiquitous snacks with blue potatoes! We were sent samples of [amazon_link id=”B000EQX62Y” target=”_blank” ]Terra Blues Potato Chips[/amazon_link]. I do wish these yummy chips were made with organically-grown blue potatoes. 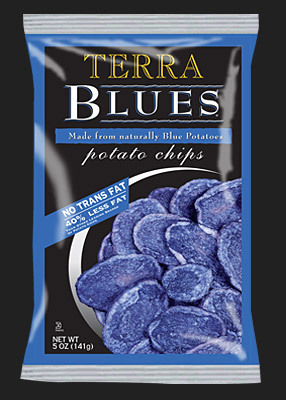 TERRA BLUES® Potato Chips are both flavorful and visually appealing. Made from natural blue potatoes, TERRA BLUES® Potato Chips are bluish-purple in color and feature a slightly nutty flavor. Each savory batch is cooked via a special cooking process, which gives you a lower fat chip without sacrificing color or taste. With their natural color and sophisticated taste these chips are truly one of a kind. I like cooking with blue potatoes, as they add color and delight to my dishes. It’s amazing how color can affect taste. I don’t really think that blue potatoes or blue potato chips taste any different than their typical counterparts, but the color does seem to have some psychological effect. It’s also fun and a good educational lesson for our children to realize how many different varieties of fruits and vegetables there are! An apple is not just an apple. A potato is not just a potato! When I was a child, you never saw a blue potato in the grocery store, let alone a blue potato chip!